I wonder why I have never thought about using buffer capacity when selecting my buffers. Could be it is too hard to calculate by hand, but what the heck, we have computers and 21st century! While in general I am against cheating, there are situations when some cheat sheet becomes handy. Not to cheat others, but just to make life easier. For your own use I have prepared the concentration cheat sheet that you can download from this site as pdf file - concentration-cheat-sheet.pdf (80kB). 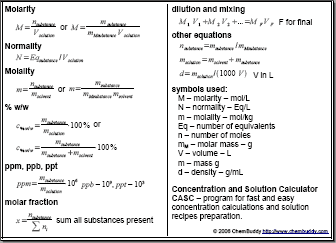 Concentration cheat sheet helps in concentration and conversion calculation, as it contains some most often used formulas and definitions. It also contains density tables for a few selected reagents. 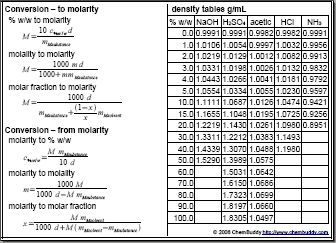 See our density tables for more detailed explanation. To use concentration cheat sheet download the pdf file and print it on both sides of paper, then cut the concentration cheat sheet with scissors or knife. Concentration cheat sheet has size similar to that of the MtG cards. Concentration cheat sheet can be then folded in half, so that is is even smaller and can be easily put into calculator case. The concentration cheat sheet can be printed on any good b&w printer - I have tested it on almost 10 years old LaserJet 5L and the results were perfect. If you like our concentration cheat sheet - and you have your own page - feel free to link to this page: http://www.chembuddy.com/?left=CASC&right=concentration-cheat-sheet. Let the word spread out.